Whether traveling to camp or school or heading off to visit family, sometimes allowing your child to fly alone just can’t be avoided. When a child flies without the presence of a legal guardian, they are referred to as an “Unaccompanied Minor” and require special supervision – which also provides peace of mind for parents. 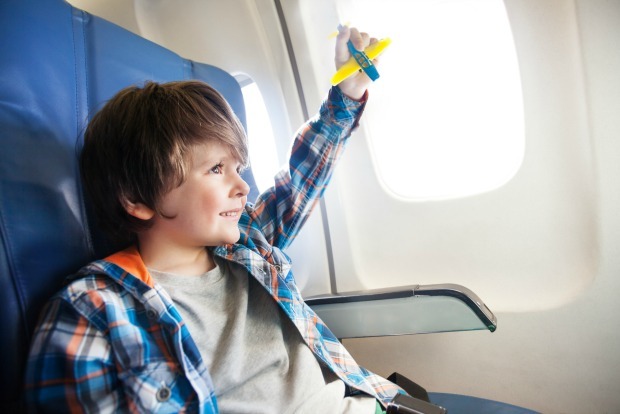 Each airline has its own rules in regards to Unaccompanied Minors, including age requirements, cost, flight limitations and amenities included, so it’s important to look into the rules of the airline you plan on booking with. While parents may be nervous to allow their children to fly alone, flying as an Unaccompanied Minor provides extra care through the whole process. Prep for your child’s solo flight with our tips, and consult our guide to the policies of the major carriers below. When you’re ready to book, head over to Cheapflights.com, where you can search and compare your flight options. Cell phone: If your child doesn’t have a cell phone, it’s a good idea to get him or her a pay-as-you-go phone – an easy form of communication for emergencies. Pay-as-you-go phones can be purchased from any cell phone retailer. Gift cards: Invest in a few pre-paid gift cards worth $25 or $50, which will let your child purchase food or any unexpected expenses along the way. This will eliminate the worry of travelling with a large amount of cash. Family/friends contact information: Give your child a complete list of names, numbers and addresses of the people who are picking him or her up at the airport. Photographs: Provide a picture of the person(s) your child will be meeting at the airport, and write out the person’s complete contact information on the back of the photo. Copy of passport and other ID: It’s always a good idea to pack a photocopy of the child’s passport and other identification in his or her luggage. Medication: Make sure your child has all medications he or she needs and is comfortable taking medications on his or her own. Consult our guide to traveling with medication for more information. Details of the day’s schedule: Make sure your child knows what to do in an emergency. For example, provide instructions on how to handle flight delays or cancellations. Let him or her know how to handle overnight accommodations if necessary. Provide at least two copies of this information and store it in two different places. Snacks: Pack some munchies and an empty water bottle for your child to fill at a water fountain past security. Entertainment: Make or buy a travel pack to keep him or her entertained during the flight. Include items like (depending on age) coloring books, crayons, books, a tablet stocked with TV shows and games, handheld video games and a favorite toy. Be in-the-know: Contact your preferred carrier in advance of making a reservation for specific information and guidelines regarding children traveling alone. Try to book a morning flight: That way, if for some reason the flight is delayed or canceled, you have the rest of the day to make alternate plans. Write out the details: Anyone younger than 17 flying alone on an international flight must have a signed note from a parent or guardian giving permission, destination and length of stay. Provide the right info: Parents must provide information regarding who will be dropping off and picking up their child from each airport. Children are escorted off the aircraft by a flight attendant and released to the designee or another designated employee. Go over the itinerary: Familiarize your child with his or her itinerary and make sure all travel documents are kept in a safe place – especially if they’ll be needed for a return flight. Make smart clothing choices: Make sure your child doesn’t wear any clothing that has his or her name on it, which would make it easier for an impersonator to convince a child they can be trusted. Choose the right luggage: Choose luggage that’s easy for your child to carry and recognize to minimize airport stress. Arrive early: Unaccompanied Minors are usually pre-boarded, so airlines recommend allowing plenty of time to check in and get through security. A relaxed pace will also be less stressful for kids traveling solo. Inform the flight attendants: Make sure the flight attendants know your child is traveling alone. Confirm that he or she will be seated in an area of the aircraft that’s convenient for attendants to keep an eye out – the very front or very back of the aircraft is ideal. Get confirmation (if you can): If possible, have your child contact you once they land and then once again when they’re with the person who is picking them up. Age: 8 to 11 years old – must purchase Unaccompanied Minors (UM) service; 12 to 17 years old – UM service optional; Children under 8 cannot travel alone. Cost: $100 per child each way. Flight restrictions: Available on non-stop flights only. How to book: Contact Air Canada reservations. Age: 5 to 7 years old – non-stop flights only; 8 to 12 years old – Non-stop and connecting flights; Children under 5 cannot travel alone. Cost: $25 each way, per child (non-stop flights); US $50 each way, per child (Connecting flights). Flight restrictions: Travel may not begin between 9 p.m. and 5 a.m.
How to book: Book online or by phone. Age: 5 to 7 years old – non-stop or direct flights only; 8 to 14 years old – Can travel on any non-stop or direct flight, or any connecting flight through Charlotte, NC (CLT), Washington Reagan, D.C. (DCA), Dallas-Forth Worth, TX (DFW), New York, NY (JFK and LGA), Los Angeles, CA (LAX), Miami, FL (MIA), Chicago, IL (ORD), Philadelphia, PA (PHL) and Phoenix, AZ (PHX); Children under 5 cannot travel alone. Cost: US $150 each way (only one fee applies for two+ siblings flying same itinerary). Flight restrictions: Non-stop, direct flights only. How to book: Call Reservations. Age: 6-11 years old – must purchase OpenSkies Solo Flyer service; 12-17 years old – OpenSkies service is optional; Children under 5 cannot travel alone. Cost: US $150 each way. Flight restrictions: Service only available for flights departing from the U.S. or France. How to book: Contact OpenSkies to book. Age: 5 to 7 years old – nonstop or direct flights only, 8 to 14 years old – nonstop and connecting flights; Children under 5 cannot travel alone. Flight restrictions: Unaccompanied minors are not permitted on Red Eye flights (between 9 p.m. and 5 a.m.), with the exception of flights departing from Alaska or Hawaii and connections to/from international flights. How to book: Contact Delta Reservations Office. Age: 5 to 14 years old; Children under 5 cannot travel alone. Cost: $110 each way, per child. Flight restrictions: nonstop or direct flights only. Age: 5 to 11 years old; Children under 5 cannot travel alone. Cost: $35 each way (within Hawaii); $100 each way (within North America). Flight restrictions: Non-stop flights only; No international flights. How to book: Call Hawaiian Airlines Reservations. Cost: $60 each way (only one fee applies for two+ siblings flying same itinerary). Flight restrictions: non-stop or direct flights only. How to book: Book via Icelandair Reservations at 1-800-223-5500. Cost: $100 each way, per child. Flight restrictions: non-stop flights only. How to book: Book by calling 1-800-JETBLUE (538-2583). Cost: US $59 each way. How to book: Book via the Norwegian Contact Centre at 1-800-357-4159. Age: 8 to 12 years old – service is mandatory, 12 to 17 years old – service is optional; Children under 8 cannot travel alone. Flight restrictions: Parents must wait at the airport until the flight has been airborne for 20 minutes. How to book: Book via the Porter Call Centre at 1-888-619-8622. Age: 5 to 14 years old – service is mandatory; Children under 5 cannot travel alone. Flight restrictions: Non-stop and direct flights only; No international flights. How to book: Book online (Choose ‘0’ adults and the number of children flying solo). Age: 5 to 11 years old – service is mandatory; Children under 5 cannot travel alone. Cost: $50 each way, per child. Flight restrictions: Non-stop flights only; No UM service to/from international destinations. How to book: Book a UM reservation online or by calling 1-800-I-FLY-SWA. Flight restrictions: Unaccompanied minors can only travel on nonstop flights operated by United or United Express. How to book: Book online or by calling a United Customer Contact Center. Cost: $75 for short-haul flights (less than two hours); $100 for flights more than two hours in duration; $125 for international flights. How to book: Call Virgin American Reservations at 1-877-FLY-VIRGIN (the service fee will be waived for this call). Flight restrictions: Non-stop flights only; No red-eye flights or flights that depart before 5:30 a.m. or arrive after 10 p.m.
How to book: All reservations for an unaccompanied minor must be made by calling at 1-888-937-8538. Cost: US $89.99 each way (only one fee applies for two+ siblings flying same itinerary). How to book: The fact that a child will be travelling unaccompanied must be noted at time of booking. Contact WOW Air to book. Have your children flown solo? Share your experience in the comments below and start your flight search on Cheapflights.com. Editor’s note: Hello, travelers. We revised this post for you to make sure it’s up-to-date, comprehensive and even more awesome. We do our best to bring you the most timely information, but until superhuman speed is perfected, we can only move so fast. This information is subject to change, so please always double check current policies with your airline or agent before you book.